A few nights ago I embarked on a late-night walk with my beloved. 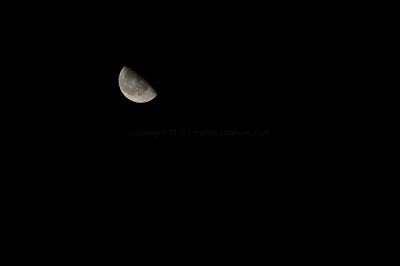 As we swung around the neighborhood circle to face the northeast, we noticed the gibbous moon rising, an enormous bowl of light just cresting the trees. The moon looks so deliciously huge when it first rises. This has always impressed me as some kind of nature's magic: if only I could reach a little further, I could pluck that peach from the heavens and feast until I burst. I was taught as a child that rays of the sun bend as they pass through our atmosphere, thus creating this "Moon Illusion" that the moon appears of a larger size on the horizon. Then a year ago, I learned that I was taught wrong. The moon actually stays the same size, even in appearance, from its rising to its setting. The Moon Illusion exists only in our minds. The difference is a matter of perspective. Do you believe me? Next time you see the moon on the horizon, hold up your finger and blot it out. A little later, when the moon appears small while high in the sky, hold up your finger again. Does it take the same size finger at the same distance from your eye to blot out that orb of light? The moon looks huge when close to the ground, because it shines close behind trees, buildings, mountains, whatever lies on the horizon. Up in the sky, with no points of reference, it definitely looks like the "lesser light." With no points of reference, we fail to grasp the magnitude of the sky. The plains of Texas offer a seemingly unlimited view of the nighttime sky. That sky sets a wildness in my heart and births a longing in my spirit, for something bigger than I can comprehend. Sometimes I catch myself wishing I could run and jump onto the moon before it clears the treetops, and ride it high into the heavens. Eventually my problems get put into perspective. They rise into the impossibly huge sky where they belong. And suddenly, they look so small in that vast universe of God's grace. The problems don't change size, but my perspective certainly does. Next time I find myself with a rising problem that begins to dominate my spirit, I am going to remind myself to send it rising on its way, into the sky where God's version of the Moon Illusion will shrink it down to size. The photos in this post were actually taken the same night I was looking at the moon and thinking about the size of the sky. 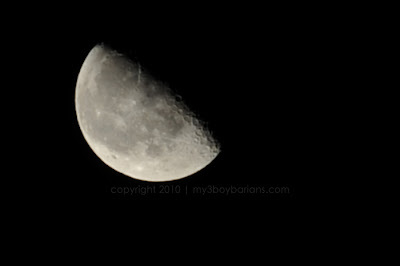 Darcy, a blogger I follow, happened to have a "Shoot the Moon" assignment, and posted her photos the next day. Krista, I love this. It's amazing what difference perspective can make, and how absolutely convinced we can be that we're seeing properly. I'd never heard this about the moon -- I'm just shaking my head. Thanks for stopping by tonight and your kinds words. HCB is such a great community, and it's very nice to meet you.